Join the discussion on our forums! Come discuss Ghostly Charger over in our dedicated Ghostly Charger discussion topic. This is still in the Exotic Beasts package in Monster Hunt. Not sure if that's intended, because it has no beast synergy at all anymore. Currently using it in my Keleseth midrange Paladin (Keleseth The Hipster). So far, it's been a very valuable asset. 5 mana 4/5 DS and Rush? I'll take that any day. I call a sleeper never to become awaken. Perfect stat line and abilites for the current meta. 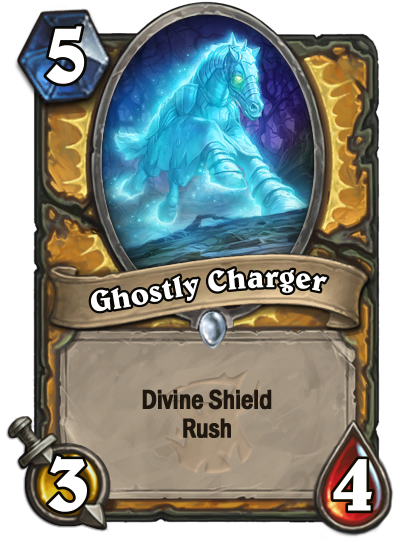 Flavor text:"Maybe we should have called him Ghostly Rusher. "- yeah probably you should.. or give it charge.. now it's name is awkward. Another ghost beast to make Spectral Spider jealous. Blessing of Might, New 1/2 Echo spell, hand buffs. Gotta remember with any deck you may have thought was trash, new cards can push its power level. Just reminding me of the long forgotten Deathcharger. Then I think about how cool it would be for them to update the boss decks in Naxx. Could do the same with a better cards. Just another pack filler for Paladin. So whats now... 1-2 cards having chance of getting included in meta? Cool... well we lasted for a while as a top dog bois, back to obscurity. Bolvar, Fireblood comes in mind. Good for defense but without any buffs it won't be enough to contest the board on turn 6 and later. Arguably better than Argent Commander because of the lower cost and higher health. Don't forget that paladin has absolutely top tier turn 4 and 6 plays, give them a strong 5 drop and if they curve well you're screwed. That art is quite lovely. Oh, card's pretty cool too, relatively reliable and solid effect even if not the strongest. Nice.